Wab 794 this is your story. Posted November 25, 2013 by nzrailadmin & filed under History, Restoration. Our Society’s steam locomotive Wab 794 was leased to Feilding and District Steam Rail Society on 1 February 1997 for restoration to service. It was transferred to Feilding, where it arrived on 22 March 1997 to be overhauled. It has worked excursion trains based at Feilding since. Feilding and District Steam Rail Society has restored a matched rake of passenger carriages a bogie tank wagon for water supplies, and a bogie highside wagon for reserve coal supplies to be hauled by Wab 794 as needed. Wab 794’s first revenue excursion was a trip through the Manawatu Gorge in August 2003. Load tests had been successfully carried out on 7 July 2003. In 2018 Wab 794 is near the end of another ten-year boiler survey and overhaul, after which it will again return to excursion train service on the main line. Photos of Wab 794 in service. The original lease was for a term of 25 years, with right of renewal. Renewal of this for a further term was agreed between the two societies in 2017, but has yet to be signed. The Feilding society has built a wide measure of community support for its train operations out of Feilding. Wab 794 had worked in the Manawatu area before, being allocated to Wanganui for a period in the mid-1950’s. 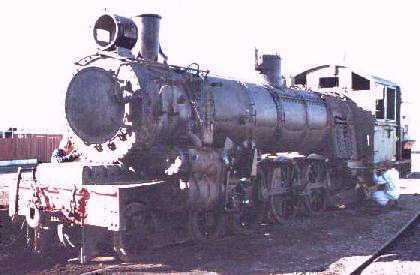 It is one of two of this class of heavy tank engine that have survived. The engine worked twenty-eight and a half years for New Zealand Railways and a further nine years for the Ohai Railway Board in Southland. It was been on static display under cover at Ferrymead Historic Park(Christchurch) for 29 years, except for being towed in the parade of engines during the Ferrymead 125 celebrations in 1988. A total of 30 of these were built by NZR. No. 794 was one of a batch of ten built 1926-27 at Hillside workshops for use between Dunedin and Oamaru, on the South Island Main Trunk line. Except for No. 790, the others were converted to Ab class tender engines 1947-48 for continuing use in the South Island. Wab 790 was converted likewise in 1957 after a period of work in the North Island. Hillside workshops completed engine 794 in May 1927, NZR’s makers number 251. Traffic had been building up and there was a need for more powerful engines on the line north from Dunedin which has 1 in 50 grades in combination with 7.5 chain (150 metres) radius curves. Because of the side tanks and the water they carried, the Wab class had loads of 14 tons on the driving axles, some 17% more than the equivalent Ab class tender engine. 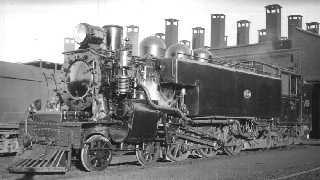 Consequently the boiler pressure was increased by 11%, to 200 pounds per square inch, giving the Wab a useful increase hauling capacity. The ten of them were the prime sloggers on the Dunedin-Oamaru route until March 1940, when ten J class 4-8-2 tender engines arrived from Scotland. These displaced the big tank engines to a considerable extent. Alternative work in the South Island for the Wab class was limited because of their high axle loads and concentrated weight of 71.5 tons. Weak bridges and track north of Oamaru and south of Dunedin limited their availability through their South Island working life. The likeliest alternative duties, in Canterbury, were being handled by Kb and G class tender locomotives, both of which had much greater fuel and water capacity. Meanwhile, wartime traffic had been building up in the North Island, so in June 1942 two of the South Island Wab’s, Nos. 794 and 790, were transferred to Wellington to work suburban and other trains. No. 794 is noted for its involvement in the derailment of a suburban train at Haywards in November, 1943, an accident largely contributed to by a lower standard of maintenance prevailing under wartime conditions. After recovery, the engine went to Woburn workshops for repairs that were particularly thorough. It was totally stripped down into components so the frames could be straightened and annealed before reassemble. As electrification of the Hutt Valley suburban lines progressed towards completion in 1954, engine 794 was transferred to Wanganui, to help on the heavily graded lines in that area. Its stay was only a short one, for the introduction of diesel-electric locomotives on the North Island Main Trunk line was soon to displace K class engines to Wanganui and Taranaki, which in turn displaced the older engines of classes X and Wab with their more restricted usefulness. At that time the Ohai Railway Board, operator of a line from the terminus of the NZR’s Wairio branch line to the Ohai coalfield, was looking for a locomotive to take over the work done by their X442. Wab 794 was chosen and shipped to Hillside workshops for overhaul. The official sale date to the Board was 31 August 1955. The engine had run 837,400 miles for NZR (1.35 million kilometres). Changing circumstances led the Ohai Board to buy two 200 h p Drewry 0-6-0 diesel-mechanical locomotives later in the decade, these displacing the steam engines to stand-by duties. This arrangement continued until 1968. Last recorded working of 794 for the Board was its use with X 442 to haul a passenger train organised by the Otago Branch, NZRLS, on 21 November,1964. Early in 1965 the Board offered these two steam locomotives to NZRLS, X 442 to the Canterbury Branch and Wab 794 to the Otago Branch. (The Otago Branch was already actively working on their railway preservation project, Ocean Beach Railway.) The latter group could not accept so big an engine on their site, so the Canterbury Branch offered to take both on the site they were working to establish at Ferrymead. The following year’s Local Legislation Act authorised the Ohai Railway Board to donate its two steam locomotives to NZRLS for the purposes of their maintenance and preservation as historical articles. Because of weight restrictions on two bridges en route, the two were towed from Wairio to Dunedin on goods trains in March 1968. Well known engine-driver and now manager of Kingston Flyer Ltd., Russell Glendinning, did much of the work to make sure the transfer moves took place safely. A week later, Wab 794 was steamed to haul X 442 from Dunedin to Timaru for secure storage (15 March 1968). Its move to be placed on site at Ferrymead took place on 1 October,1978.